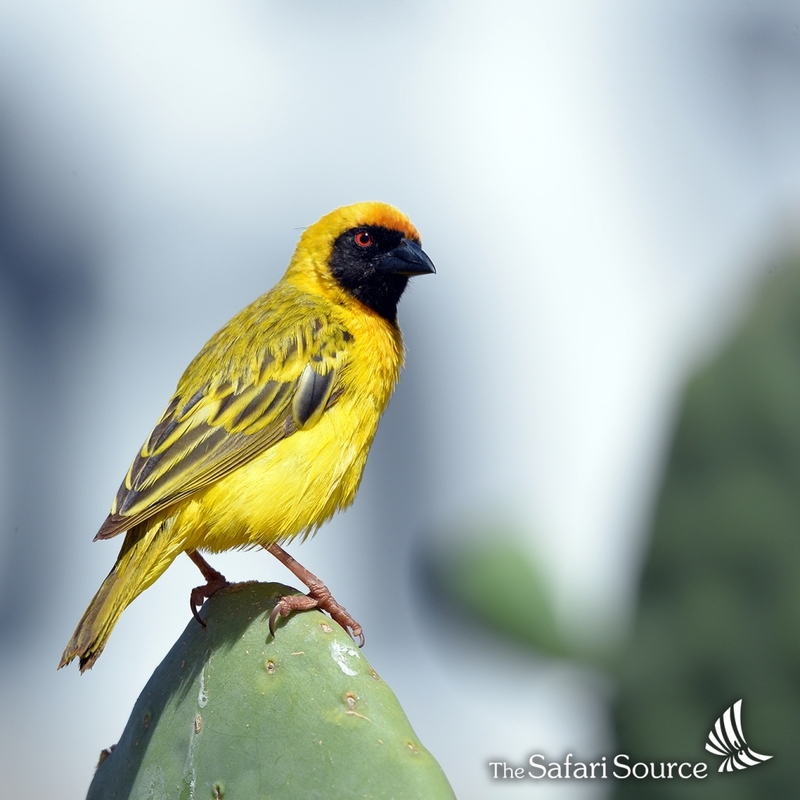 It is no secret that we LOVE birds at The Safari Source. Every time we go on safari (or anywhere else for that matter), we come home with cameras and hard drives full of bird pictures! So we would like to share the excitement with you, and look a bit closer at some of our favourite African birds! Click on the pictures to see the birds more clearly – we promise it is worth taking a closer look! 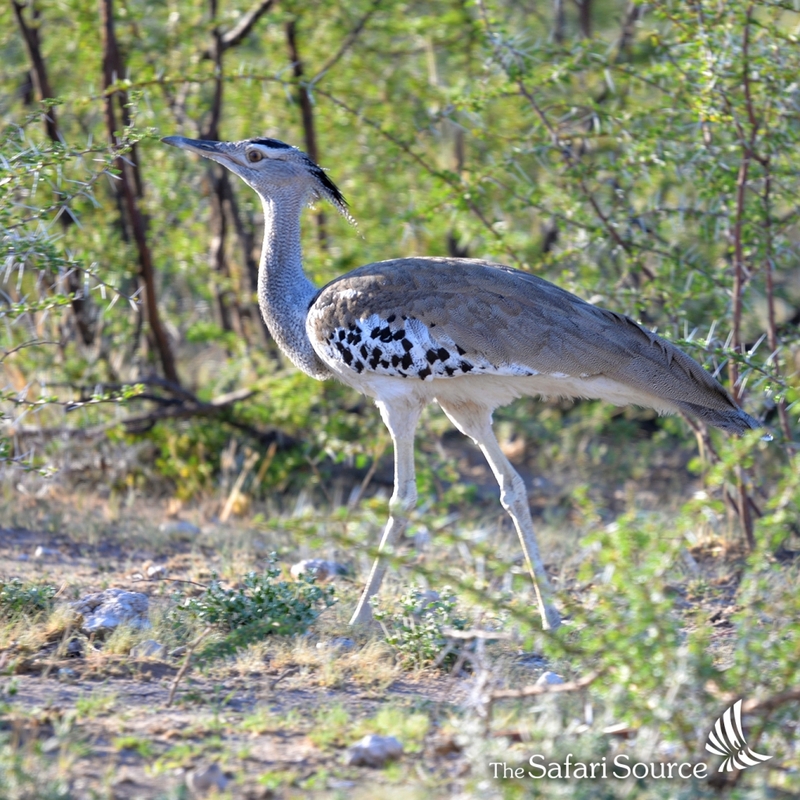 The Kori Bustard stands up to 120cm tall, may spread its wings to a wingspan of 275cm and can weigh over 10kg. Although it is a shy bird which is mostly found walking – it is the largest flying bird native to Africa! The bird is found on open grassy areas throughout southern Africa. It feeds mainly on insects, grass and seeds, but can also snap a chameleon, a small snake or even a small rodent if the opportunity will have it. If you want to see one, it is useful to know that it is most active in the early morning and in the late afternoon to evening. We met this guy one late afternoon in Namibia, where it is quite commonly found in protected areas. Outside protected areas it is more uncommon, and the species is considered near threatened. This is mainly due to habitat destruction – as we mentioned, it is a very shy bird – and does tend to avoid areas where we humans have taken over. 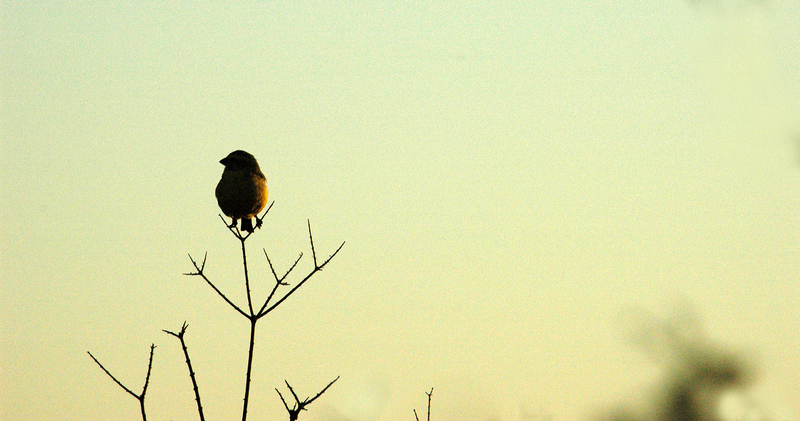 Easy to recognize even in silhouette and also by sound – this bird is named after its voice. When you find yourself in the southern parts of Africa and hear: “Hoop-oop” or “Hoop-oop-oop”, then you can be fairly sure that you are hearing one. The bird measures 25-28 centimeters in length, and weighs 40-60 grams. With its long pointy beak and its proud head-feathers, which it raises when it is alarmed, it makes for quite a silhouette! 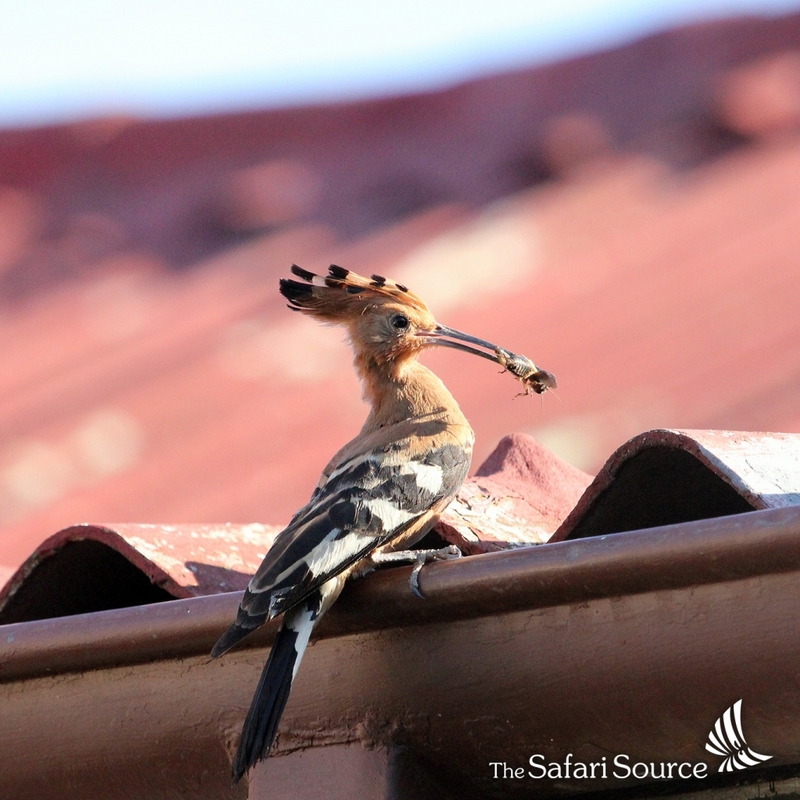 The pictures were taken at our Zimbabwe offices, which this Hoopoe also had choose to call its home (under our roof). 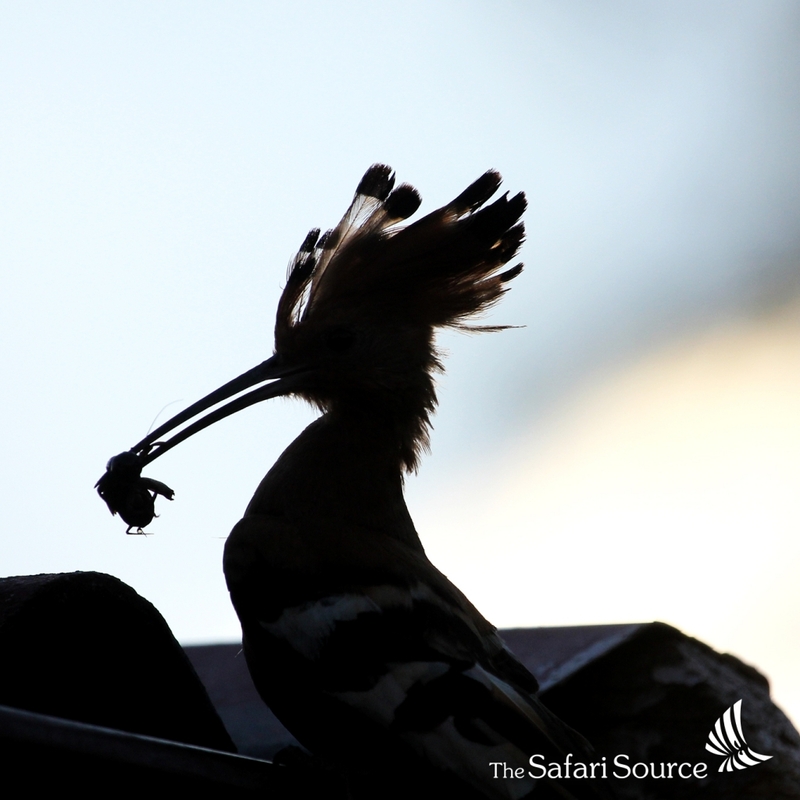 As you can see, the Hoopoe feeds on insects and larvae, which it digs up from the ground using that practical long beak. When we came across a group of these as we were traveling through Hwange National Park in Zimbabwe, we felt as if the Kings and Queens of Hwange had decided to grant us a visit into their Kingdom. Standing 1 meter tall, with a wingspan of 2 meters, steel-blue eyes and that golden crown of stiff feathers on their heads – they do have something royal about them… These royals are an endangered species, so we considered ourselves privileged granted the audience. 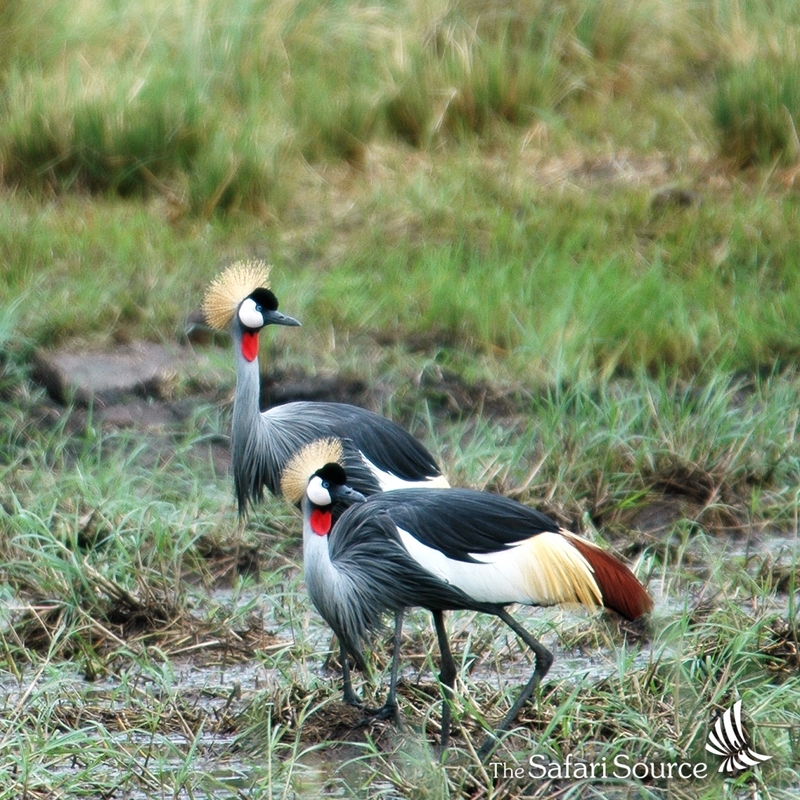 The Grey Crowned Crane and the similar Black Crowned Crane are the only cranes left which still can make nests in trees, as they have a long hind toe, which they can use to grasp branches. It lives in areas of dry savannah south of the Sahara, but is mostly found nesting in wetter habitats, like marshes and grassy flatlands near rivers and lakes. Here they find some of their favourite foods in addition to plants and seeds; insects, frogs, worms, snakes and small fish. 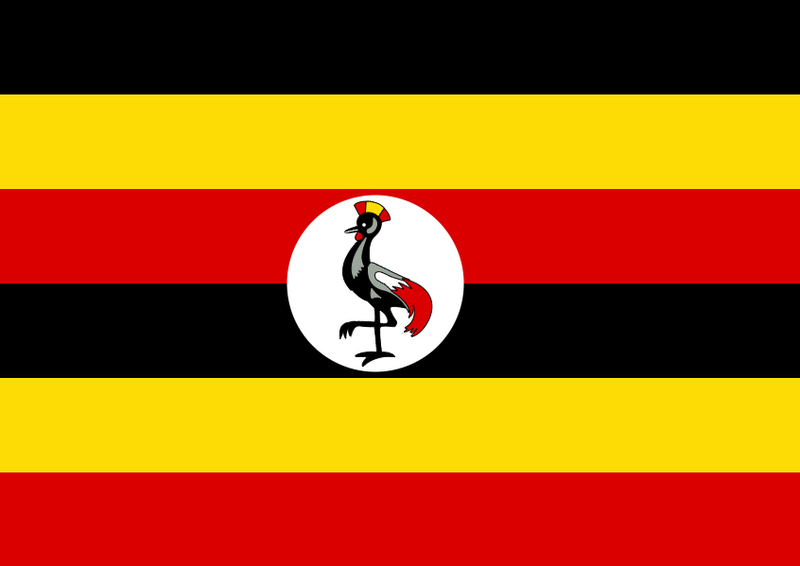 The Grey Crowned Crane is the national bird of Uganda – have a look at their flag – there it is too! They might be small with their 14 cm, but these birds certainly have superpowers! On the picture you see a male, while the female has a brighter, dull green-yellow color and is missing the black face and the red eyes. Their superpowers come in when it is time for reproduction. They make colonies of nests, often hanging in trees over water or even in human constructions. 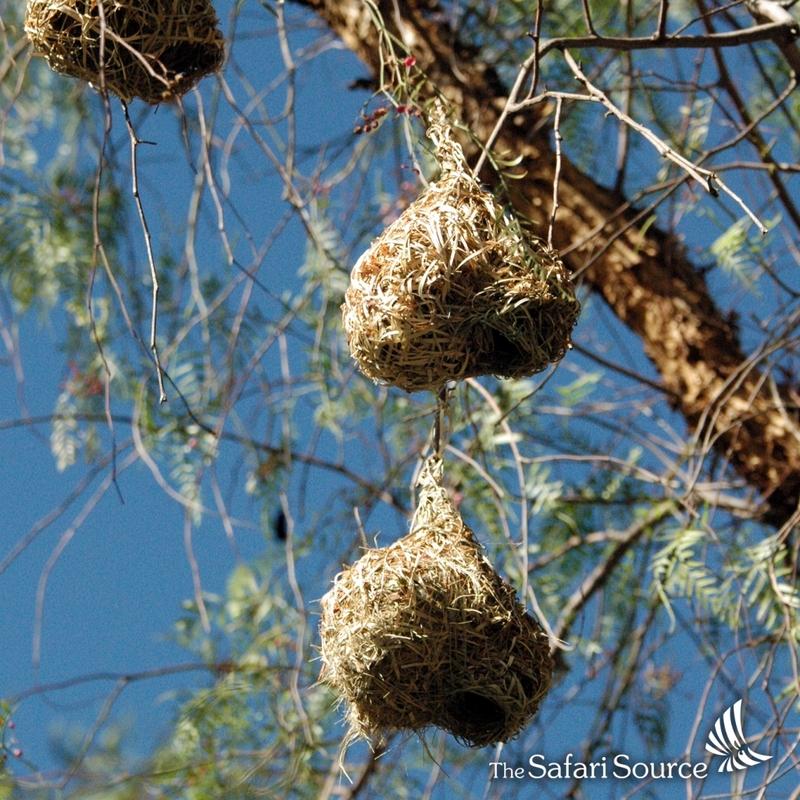 The nests are woven from reeds, palm and grass- these small birds are quite the architects! Another superpower is the ability to lay eggs in a variation of colors – and use the color for identification! When a cuckoo comes and adds an ‘unsuspected’ egg to the nest, the Weaver will sort it out based on its color and get rid of it. You may find him bouncing around in forests, savannah, suburban areas and woodlands across southern Africa. They bounce on the ground and from branch to branch looking for food, but also as they don’t fly very easily and only do that for short distances. 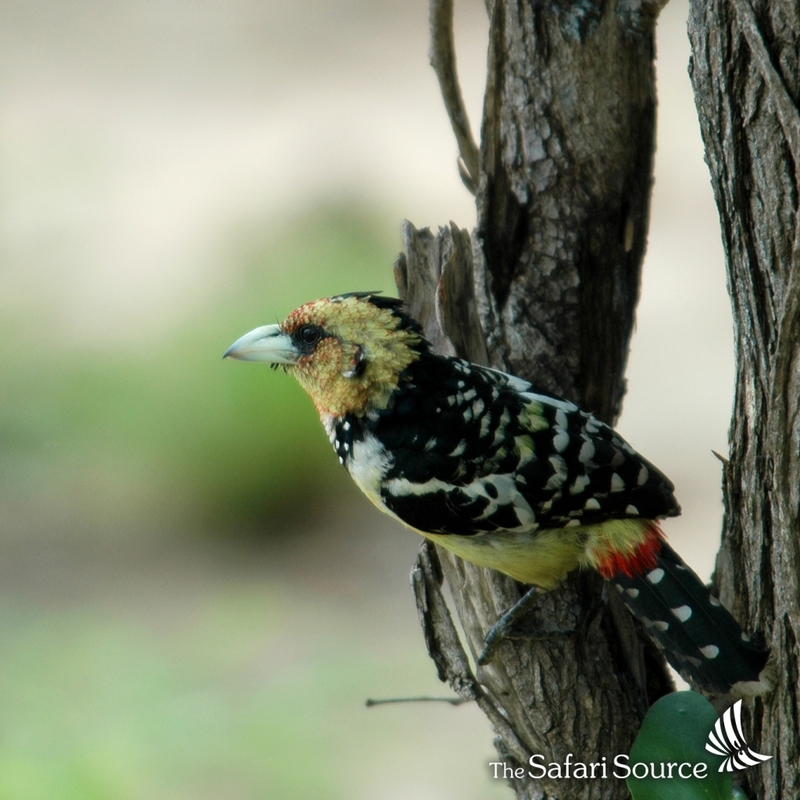 The Crested Barbet’s colorful feathered suit makes it easy to identify, but his speckled appearance also provides good camouflage in the bush. They roost in holes in trees and are extremely territorial, which can cause them to get quite aggressive towards other birds. Some have even seen them attack snakes and rats, but mostly they feed on insects, fruits and other birds’ eggs. Kingfishers are a family of small birds with large heads, long and pointy beaks and short legs, found across many parts of the world, including southern Africa. They come in many patterns and colors and have also adjusted to many different habitats. In this image you see a Grey-Headed Kingfisher. We came across this one in Matopos National Park, Zimbabwe. This Kingfisher finds its habitat in woodland, scrub and even cultivated areas, up to altitudes of 2,000 meters. It often builds its nest in steep river banks. Even if it is often found close to water, this species is not aquatic, but rather feeds on insects and small lizards. With an average length of 21 cm, you need a good camera lens to catch the details of his beautiful coat. 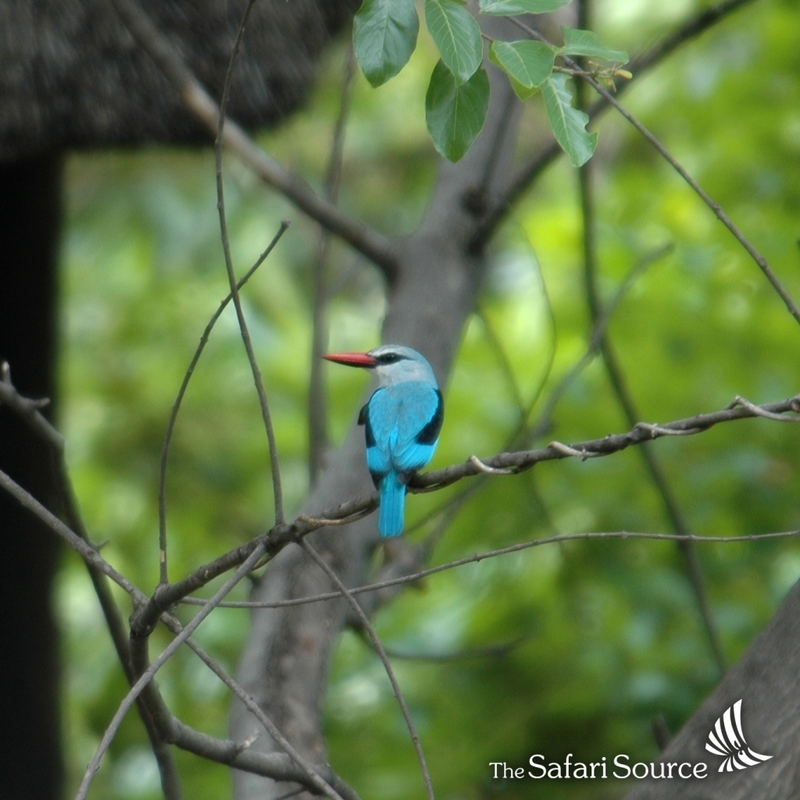 In this image you find a Woodland Kingfisher. 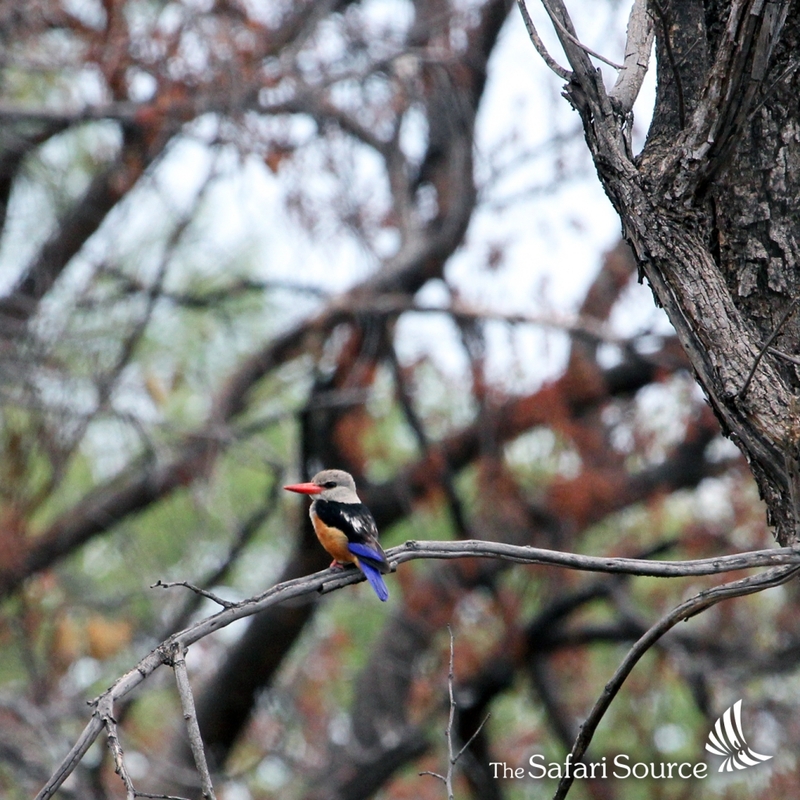 This 23cm long Kingfisher we spotted on the Caprivi Strip in Namibia. Commonly found in wooded habitats, especially where acacias grow, but also in human habitations, this Kingfisher builds his nest in tree holes excavated by other birds. He actually prefers drier areas and can be found far from water. This fellow can get up to 60 cm long, and it is not hard to see that it is his long yellow, oversized and curved beak, which has given him his nickname “Banana Bird” or “Flying Banana”. 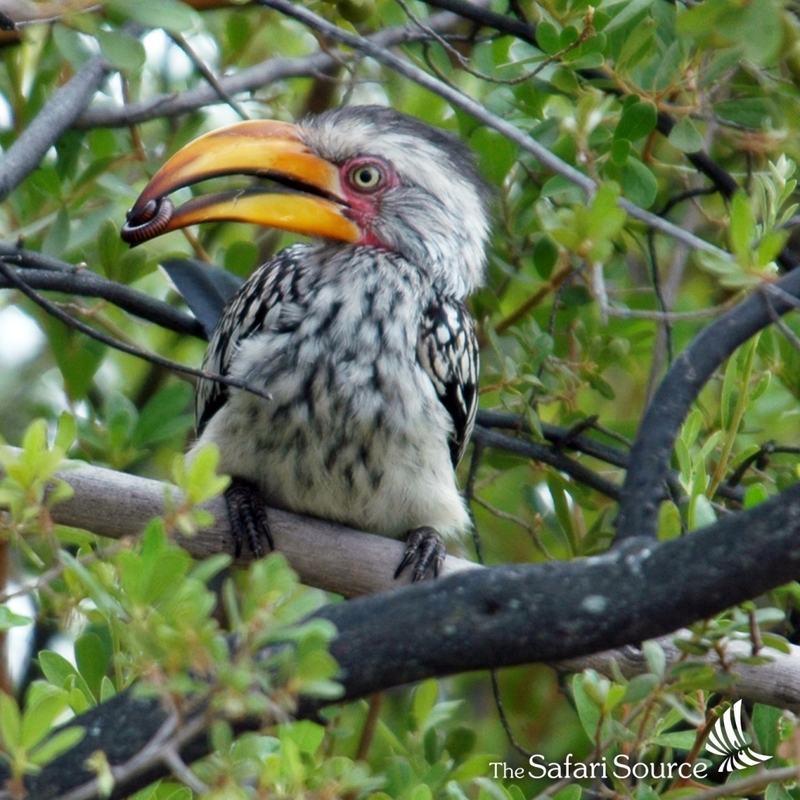 You will find him, often sitting in a tree, on open and dry savannas or in woodlands across southern Africa. However, when he flies, he does so powerfully with heavy beats of his wings! They like to snack on berries, fruits, nuts, termites, beetles, larvae, grasshoppers and caterpillars, but as you see in our picture taken in Hwange National Park, Zimbabwe, they might also catch centipedes, scorpions or even small mammals! We will not get too much into detail about taxonomy and mistaken identities, but look out not to confuse these guys with the Common Comb Duck found across the south Americas. 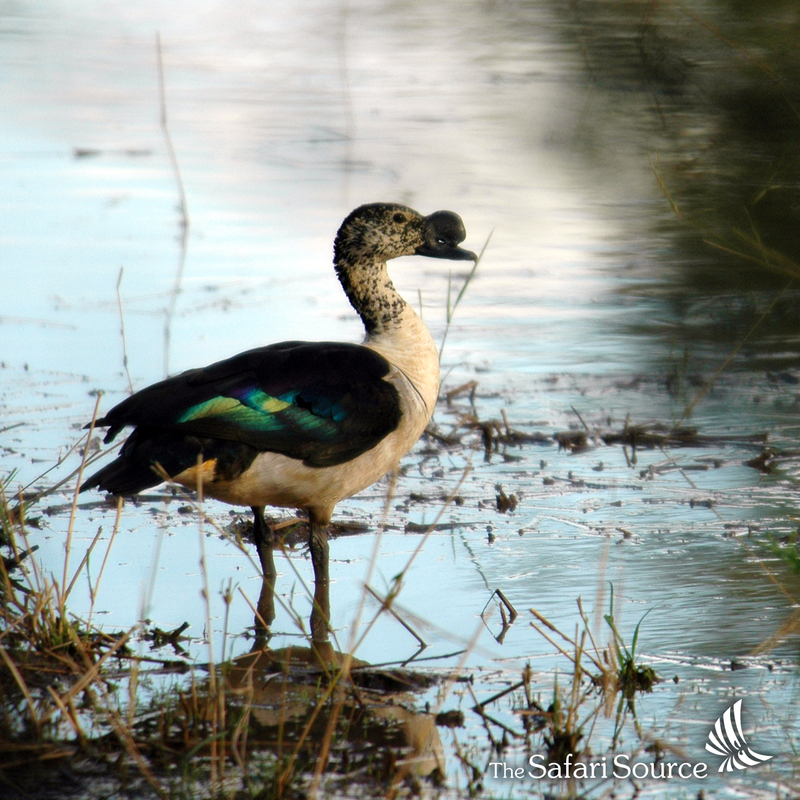 The African Comb Duck is found across southern Africa, but also across southern Asia. It is one of the largest ducks, with its up to 70 cm length and a wingspan that can reach 140 cm! They reside in freshwater swamps and enjoy grazing on vegetation, but may also snap a fish or two. If you want to see one, visit Hwange National Park in Zimbabwe – this is where we met this guy. The best time to go birding in southern Africa is the green season – read more about that in our blog post about the many reasons to travel to Africa during the green season. Find our contact form for your tailor made adventure here or get in touch with us at enquiries@thesafarisource.com for your adventure! A stay at Matobo Hills Lodge – it rocks!